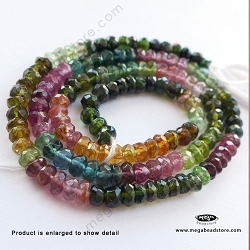 2.5mm Ruby (dyed) Smooth Rondelle Beads (GS16) 14 in. 2.5mm Mystic Spinel (Black) Faceted Beads 13 in. 3mm Labradorite Faceted Rondelle Beads 13.5 in. str. 10x7 Faceted Tear Drop Labradorite Beads 10 in. str.